That's according to AskMen, at any rate, who have picked the Activision boss at number 16 on their list of the 49 most influential men. That's one spot ahead of NBA superstar Lebron James and one spot below tennis ace Rafael Nadal. Coming in at #1 is comedian Jon Stewart, while right behind him was Bill Gates. 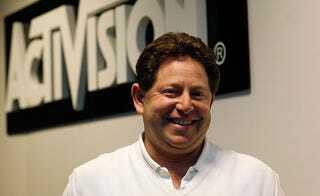 Kotick was selected because "as long as he retains control of franchises like Guitar Hero, Call of Duty and Tony Hawk, he'll continue to be one of the richest and most influential men on the planet." Richest, sure, but influential? You're only influential if you influence other people, and you don't see too many other publishers following Activision's "exploit at all costs" business model, especially when it's done so brazenly and so publicly.